A notorious PR operator is back on the move? I was thinking twice about publishing this article so I asked my Facebook followers if they want it or not. May nasulat na akong isang article about how an embattled PR operator appears to be conniving with a blogger. Do you want me to publish it? Nine-sixty percent of the over 15,000 respondents voted "Yes", so here we go. In the February 2017 exposé “#NasaanAngPangulo: Mamasapano, Mar Roxas’ Ambition, and a PR operator”, ThinkingPinoy detailed how the Liberal Party’s Mar Roxas, via his DILG right-hand man and Akbayan party-list stalwart Tomasito “Tom” Villarin, attempted to insulate himself the Mamasapano-SAF 44 scandal’s fallout through the #NasaanAngPangulo black propaganda campaign led by Public Relations (PR) operator Joyce Ramirez. Garnering over a million hits and over 64,000 shares, the article was a big blow not only against whatever’s left of the Liberal Party’s credibility, but also on the Ramirez’ professional reputation as an online political kingmaker. Public interest over this issue generally subsided until October 2017, when Senator Grace Poe’s Committee on Public Information and Mass Media called for a hearing about Fake News, a hearing where ThinkingPinoy was a resource speaker. 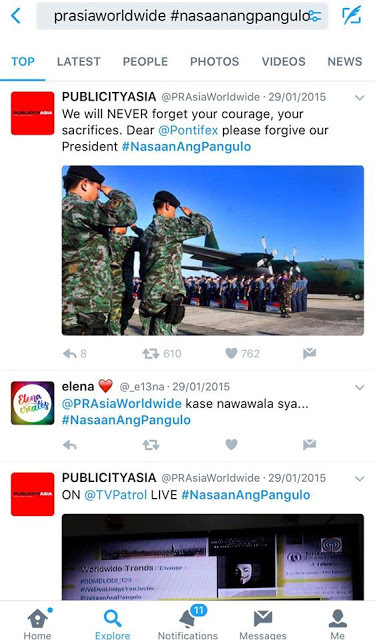 During the hearing, ThinkingPinoy cited the 2015 #NasaanAngPangulo PR campaign, where Ramirez used Twitter influencer fleet “INTERXN” to channel public dismay over the Mamasapano debacle solely on then President Noynoy Aquino, theoretically preventing bad press against Mar Roxas, who was eyeing the 2016 presidency. In the hopes of having a more honest discussion about the proliferation of online political propaganda, ThinkingPinoy recommended that the committee invite Ramirez, along with #LeniLeaks PR operator Pete Silva, the head of an unrelated PR campaign sponsored by the Office of Vice President Leni Robredo. In retaliation, Ramirez appeared during the evening news to claim that ThinkingPinoy is a “fame whore” and “social climber” and that the allegations made against her during the senate hearing are false. 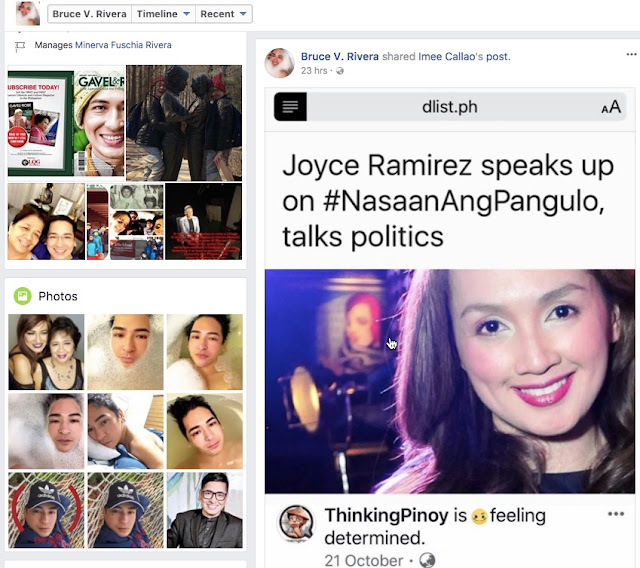 In response, ThinkingPinoy published “#CocoyGate: Mar Roxas’ ‘special assignments’ for PR Joyce Ramirez”, which provided details on how Ramirez executed the not only the #NasaanAngPangulo campaign, but also her eventual falling out with her Liberal Party-Akbayan clients after Roxas supposedly failed to pay her for her PR services on time. Garnering over 30,000 shares, the article effectively decimated whatever’s left of Ramirez’ reputation as the go-to PR person for online political propaganda as her latest client informed me that they have fired her just a couple of days after the article’s publication. Every PR operator has a fleet of influencers that she can pitch to potential clients. For traditional PR companies, that means an operator must have print, media, and radio journalists on the payroll, journalists that she can quickly tap for prospective propaganda campaigns. For online PR companies, on the other hand, that means having a fleet of online influencers, such as persons with large social media follower counts. An example of a traditional PR company mentioned in April 2017’s “On ‘Manufactured Noise’, anti-Duterte media bias makes financial sense”, which tells the story of the workings of a veteran journalist who served as an integral part of the late Bubby Dacer’s PR operations during 1990s. Dacer was eventually murdered in 2000. 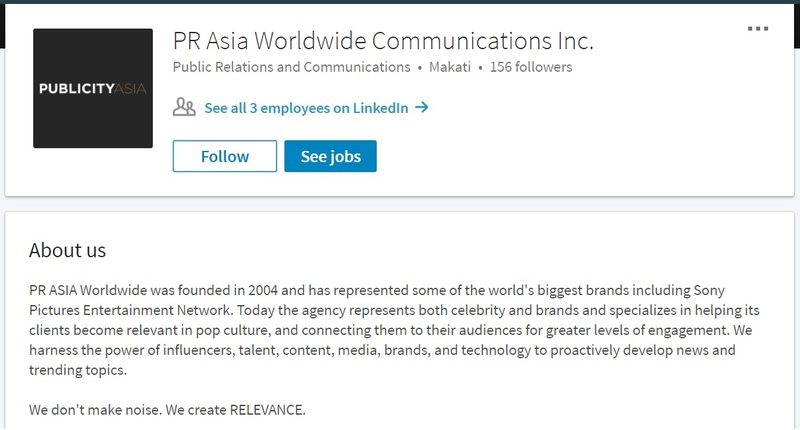 Meanwhile, an example of an online PR company is no other than Ramirez’s PR Asia Worldwide Communications Inc., whose tagline is “We don't make noise. We create RELEVANCE.” Initially engaging in solely in Entertainment PR work, the company eventually expanded to potentially more lucrative political PR work, as evidenced by the #NasaanAngPangulo PR campaign. Politicians initially recognized Ramirez’s PR Asia Worldwide for having control over some of the top local Twitter celebrities, and these fleet of Twitter celebrities, which Ramirez called "INTERXN", was PR Asia Worldwide’s bread and butter. And everybody knows how Facebook helped catapult then presidential contender Rodrigo Duterte during the 2016 Presidential Elections. More than that, Facebook was able to drown traditional media in as far as shaping the political landscape, as evidenced by the ineffectiveness of anti-Duterte political ads aired during the 2016 campaign season. This has been extensively discussed in the August 2017 article “Mainstream vs Indie: Who’s winning the social media wars?”. Suffice it to say, Facebook will be the primary barometer of the incoming 2019 National Elections. Hence, online political PR companies have probably realized that they need to have a sizeable Facebook fleet not only to stay relevant but also to command better prices come the next election season, which is in 2019. And this the challenge for PR Asia Worldwide’s Joyce Ramirez, who has yet to establish one that matches the collective influence of her INTERXN twitter fleet. Every journey starts with one step, and the first step for any PR operator who wishes to gain power in Facebook would be to access major influencers. 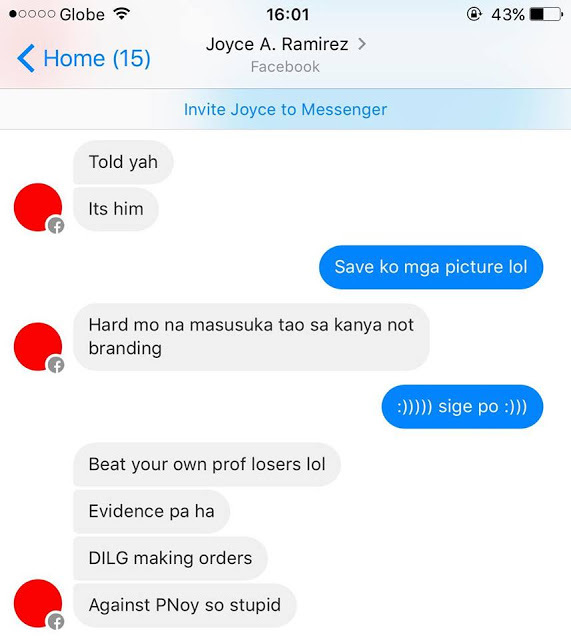 I suspect that one of Ramirez’s first major Facebook influencers is De La Salle University professor Antonio Contreras, who repeatedly attempted to set up a reconciliatory meeting between ThinkingPinoy and Ramirez, who promised his former radio show co-hosts of lucrative sponsorship deals through Ramirez, and who brazenly dissuaded ThinkingPinoy from publishing the October 2017 #NasaanAngPangulo follow-up exposé. 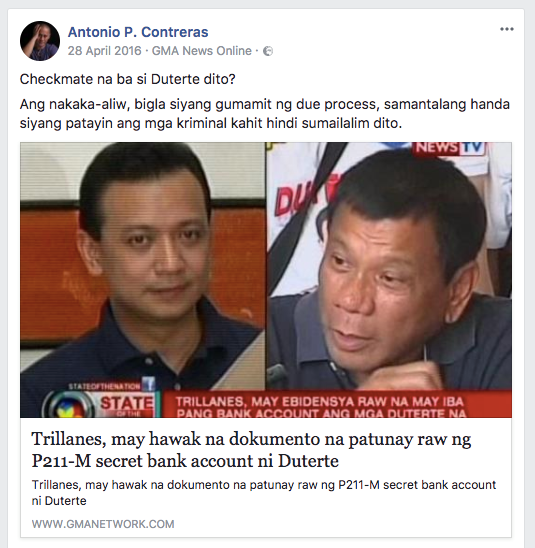 ThinkingPinoy initially gave Contreras the benefit of the doubt, until he found out recently that Contreras, a supposedly staunch Duterte supporter and presumably a consultant of the Presidential Communications Operations Office, may have serious integrity issues. Contreras was staunchly anti-Duterte in as late as 29 April 2016, or barely two weeks before Duterte won the 09 May 2017 elections. Contreras described Duterte as mabaho ang bunganga, pumapatay ng tao, corrupt, a liar, handang… patayin ang kriminal kahit hindi sumailalim (sa due process), no better than a thief, an evil human, a defiler, ulyanin, and “Dudirty”. More screenshots can be found by clicking here. In fairness to Contreras, we are all entitled to change our minds. What perplexes this writer, however, is the speed at which he did it. 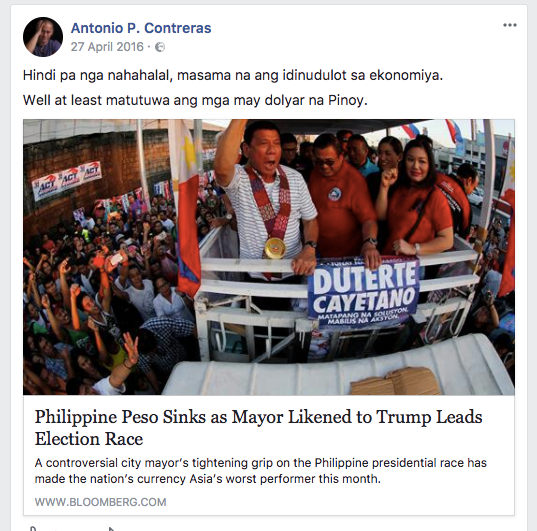 In his late April 2016 posts, Contreras even went as far as saying that he’s glad that “not a single one” of his family members was voting for Duterte, and that electing Duterte would make us “the laughing stock of the world”. 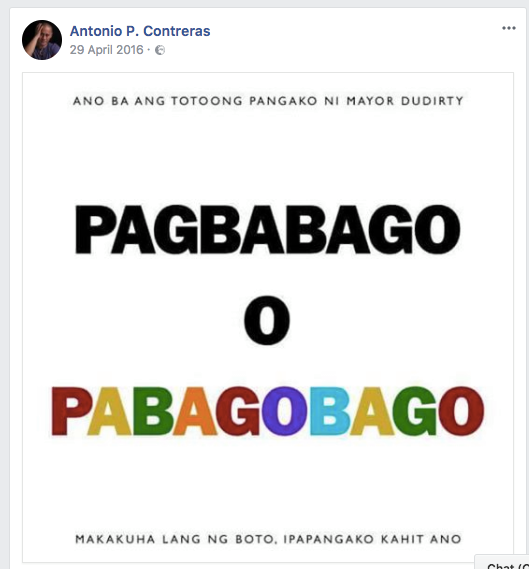 Despite this and despite having openly supported Jejomar Binay whom Duterte himself called corrupt, Contreras apparently and suddenly became a staunch Duterte supporter after Duterte won, as he even hosts the PCOO-sponsored web series “Busting Lies” even if he himself was a purveyor of lies right before Duterte earned his ticket to the palace. 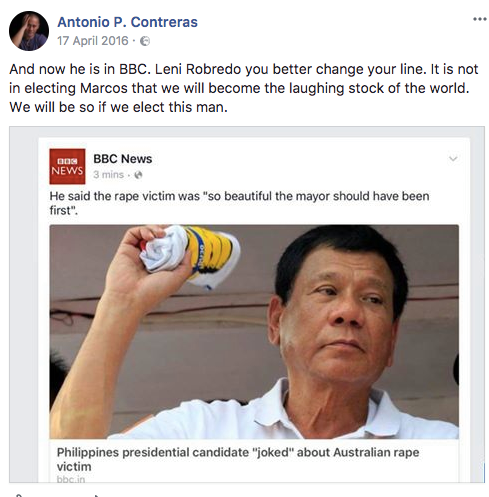 These posts were made just two weeks before the elections, and the only thing new that happened between his 29 April 2016 post and his emergence in late May as a Duterte Supporter is Duterte's winning the elections. Did Contreras believe, in a span of a few weeks, that Duterte has to ceased to be mabaho ang bunganga, pumapatay ng tao, corrupt, a liar, handang… patayin ang kriminal kahit hindi sumailalim (sa due process), no better than a thief, an evil human, a defiler, ulyanin, and “Dudirty” anymore just because Duterte won? 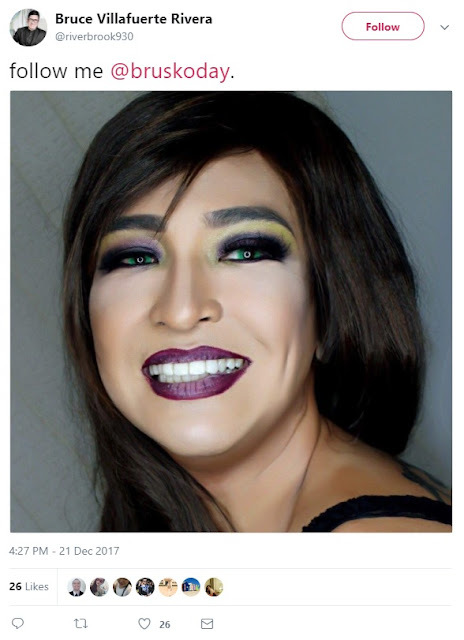 ThinkingPinoy found it hilarious that Contreras had the gall to write in his 26 December 2017 Manila Times column, “From being a platform to celebrate community that is otherwise divided by physical distance, social media has become a toxic domain for political contestations,” when the fact of the matter is that he himself contributed to the toxicity that he’s proselytizing against. If a Binay attempts to run again for president in 2022 against a Duterte-anointed candidate (e.g. Inday Sara, Marcos, or Cayetano), who would Contreras support? Contreras very confidently preaches against fake followers and fake clout despite the fact that he's chummy with Ramirez, whose business as a PR operator involves exactly that. He even promotes Ramirez among his peers. But one ship does not make a fleet, there has to be other ships in it. Evidence suggests that Ramirez may also have stricken a deal with another social media player with a considerable following on Facebook. On 21 December 2017, Atty. Bruce Rivera tweeted “Follow me @bruskoday [A]” using his long-time Twitter handle @riverbrook930, which ThinkingPinoy found odd because Rivera already has 14,000 followers on @riverbrook930 and it takes a while to get as much followers on that platform. But what’s more shocking is that Rivera’s new account @bruskoday [A] already has 85,400 followers despite having only 26 tweets, with the first tweet posted at 4:08 PM of 21 December 2017 [A]. Rivera promoting his new @bruskoday account using his old @riverbrook930 account. Having such a follower count with so few tweets is virtually impossible to achieve, suggesting that Rivera must have inherited this account from someone else. Moreover, a closer look at the “new” twitter account shows that it was created in October 2010, making the account over seven years old. That is, it appears that Rivera just “inherited” an account with many followers, scrubbed the old tweets, and changed the twitter handle from whatever it was to “@bruskoday”. Rivera inherited this account from someone else, but it would be tough to find out who it was because Rivera may have deleted all of @bruskoday’s older tweets. Rivera, however, failed to delete the entries under the “Likes” tab, which can be found here. Eleven out of the 13 liked tweets [A] were from 2015, pre-dating Rivera’s 26 tweets that were all posted two years later in December 2017. Here's a screenshot of the @bruskoday's entire "Likes" tab, click the image to zoom. The “Likes” tab of Rivera’s “new” twitter account. Click to zoom. A closer look at the tweets reveals a very interesting pattern. More specifically, let’s examine 10 out of the 11 pre-2017 tweets one by one, starting with the oldest post. 1: Queen Latifah Show (@qlshow). “Awh, @GabrielMacht, our hero! See how he's helping #ProjectWonderful: http://bit.ly/qlspwful @Suits_USA”. 19 March 2014. 8:25 pm. Tweet. Gabriel Macht of the TV series suits was an endorser of Globe Telecom’s #ProjectWonderful program, according to a Globe Telecom press release. This is interesting because Joyce Ramirez was handling Globe’s PR at the time, as Ramirez’s PR Asia Worldwide twitter account used describe itself as “powered by Globe Telecom”. But one tweet is not enough, so let’s check other liked tweets. 2: Marina Bay Sands (@marinabaysands). “@PRAsiaWorldwide Thanks for being a top tweeter last night guys”. 28 March 2014. 8:22 am. Again, the @bruskoday liked a tweet from @PRAsiaWorldWide, Joyce Ramirez’s firm. 3: Gabriel Macht (@GabrielMacht). “Condolences to our friends in the Philippines @enjoyGLOBE for the passing of @dalekins - heard he was a huge SUITS fan. RIP”. 10 July 2014. 6:28 pm. Tweet. This third tweet, again, is by Gabriel Macht for Globe, one of Ramirez’s clients. 4: Publicity Asia (@PRAsiaWorldwide). “Belated HAPPY BIRTHDAY @GabrielMacht via @Suits_USA”. 24 January 2015. Tweet. 5: Manila Bulletin News (@ManilaBulletin). “DIGITAL5 Head @coachot launches #PUSO2019 campaign as well as new online shows for @TV5Manila”. 08 July 2015. 11:27 am. Tweet. The #PUSO2019 PR campaign is funded by Manny V. Pangilinan’s Group (TV5, Smart, etc), and handled by no other than Joyce Ramirez through her now-defunct company LiveNextPR, a sister company of PR AsiaWorldwide [A]. Bruskoday’s next three liked tweets are also contain the PR campaign hashtag #Puso2019. 6: GMA News Breaking (@GMANewsBreaking). “#PUSO2019: Social media tapped to boost PHL bid to host FIBA World Cup”. 07 July 2015. 8:41 PM. Tweet. 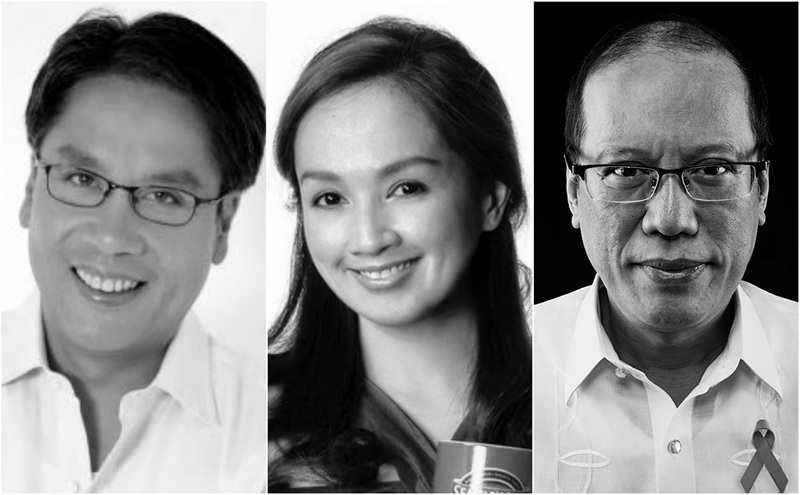 7: Pangilinan, M. (@iamMVP). “Retweet if you think the Philippines should host the FIBA 2019 Basketball World Cup”. 30 July 2015. 8:40 pm. Tweet. 8: Manzano, L (@luckymanzano). “Let's support the Philippines @FIBA bid #PUSO2019 and bring basketball home!”. 06 August 2015. 2:44 pm. Tweet. For the 9th liked tweet, @bruskoday again liked a tweet from @PRAsiaWorldWide, Joyce Ramirez’s firm. 9: Publicity Asia (@PRAsiaWorldwide). “Check out the opulent 3 bedroom @RafflesMakati Presidential Suite @GabrielMacht stayed at - fit for a Harvey!”. 16 March 2014. 10:13 PM. Tweet. And @bruskoday liked another one. 10. Publicity Asia (@PRAsiaWorldWide). “@JakeMcDorman You have what it takes to be the NEXT @prattprattpratt | Hang in there pal, you're a born star #LIMITLESS via @CBS”. 30 September 2015. 8:38 pm. Tweet. SIDE NOTE: PR industry sources indicated that the MVP group has already severed ties with Ramirez sometime after the #Puso2019 campaign. Ten out of the 13 tweets Rivera liked are part of Joyce Ramirez’s PR campaigns, heavily suggesting that the 85,400-follower @bruskoday twitter account, which apparently came of nowhere, was formerly owned by Ramirez. That is, evidence suggests that Ramirez gave Rivera one of her high-follower count Twitter accounts, which theoretically boosts Rivera’s relatively weak Twitter presence. And interestingly, Rivera yesterday shared a PR piece defending Joyce Ramirez as regards the #NasaanAngPangulo issue that ThinkingPinoy mentioned during #CocoyGate Senate Hearing. A screenshot of Rivera''s profile page, where he shared one of Ramirez's PR pieces. 1 1/2 years na lang eh 2019 national election na. If you are a political operator, ngayon pa lang i-demolish mo na ang reputation ng makakalaban ng kandidato mo. Kasi, as Duterte's candidacy demonstrated, kung mas malapit sa election time ang demolition job, hindi ito magiging successful. So dapat you do it in advance like what the Yellowtards did to Binay. Pero wait, bakit parang walang demolition job na nangyayari ngayon laban sa mga kakandidato sa 2019? Alam naman natin kung sino mga re-electionists at mga posibleng tatakbo from LP. Yet ang dini-demolish ngayon ay ang mga bloggers na merong clout sa social media. Bakit ang social media ang sinisira? Kasi, as Duterte's candidacy demonstrated, social media is a powerful antidote laban sa demolition job na gagawin ng kalaban through traditional media. So kailangan pa bang i-memorize iyan mga political operators? Putting this writer into a PR operator’s shoes, this post makes quite some sense.While it’s true that the 2019 campaign season is near, the political landscape is so fluid that it’s hard to predict who will file certificates of candidacy, except for Presidential Spokesperson Harry Roque, who has been campaigning since the PDP-Laban mass oathtaking in Cebu City a few months back. Destroying major social media players that may get in their way. The previous sections of this article demonstrate the first tactic. Meanwhile, recent events on Facebook suggest that the second tactic is already in motion. Like what Sasot said, the attacks on what is dubbed as the “Blogger Wars” are mostly directed against ThinkingPinoy and to a great extent, against Sass Rogando Sasot, who’s heavily identified with the former. 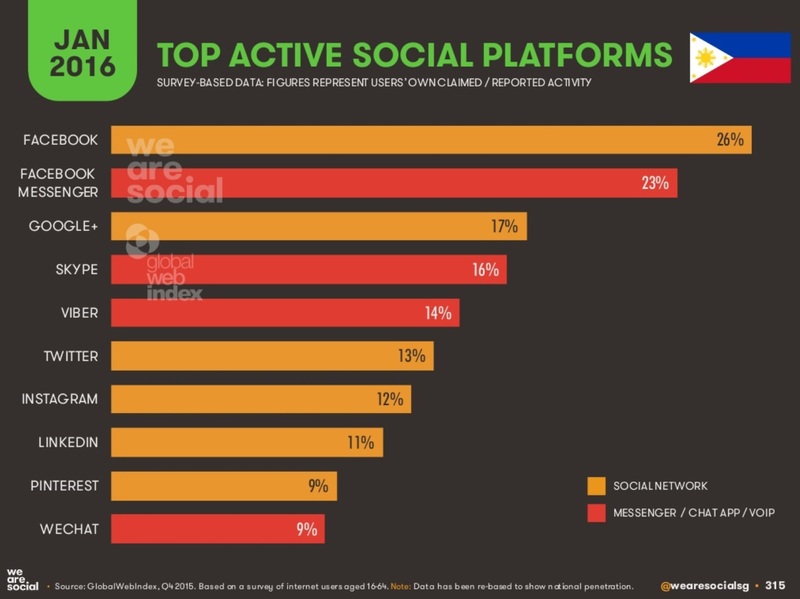 Along with Mocha Uson, the three enjoy the highest engagement rates among political bloggers in the Philippines today. Suffice it to say, Uson, Sasot and ThinkingPinoy – commonly called the “Big 3” – with their respective massive engagement figures, are in prime positions to greatly shape the outcome of the upcoming national elections. Uson, the biggest voice online in the 2015-2016 campaign season, has already definitively shown resistance to temptation by siding with Duterte, despite the fact that the latter’s biggest opponents had access to massive financial war chests. Moreover, Uson already has over five million followers, so that bringing her down will be too expensive, too risky, or downright impossible at the moment. Mocha is too big and too entrenched to topple. Thus, any given PR operator’s logical “Plan B” would be to discredit the other two: ThinkingPinoy and Sasot. While some simplistically view this phenomenon as a simple battle of fragile egos, it’s difficult to ignore the fact that those who most vehemently attack ThinkingPinoy and Sasot seem to have suddenly and entirely forgotten to criticize politicians. The two publish exposé after exposé about criminality, incompetence, and government corruption, even those happening within some factions of the Duterte Government itself, with some of their material used as resources for NBI and Senate Investigations. Meanwhile, erstwhile online political commentators have apparently forgotten to do the same as they focus all their energies at bringing the two down. This makes perfect sense from a PR standpoint, as destroying the two will create a power vacuum that, to a limited extent, similar to the one created right after then presidential frontrunner Binay’s fall from grace during the past administration. If and when ThinkingPinoy and Sasot lose their respective voices, then it becomes a free-for-all battle for influence that’s akin to mid-2015, when all social media entities pretty much enjoyed a level playing field as they jostle for a larger piece of the “influence pie”. There are two possible outcomes in a post-“Big 3” scenario where only Uson survives. First, the ensuing power vacuum will be filled and dominated by a few other players. If the replacements have strong links with a PR operator such as Joyce Ramirez, then it's a win for the PR operator. If not, then either  "operate" against the new replacement until an influencer-ally takes the spot or  settle for the new status quo if the new replacement cannot rival the engagement figures of traditional media outlets, because the PR operator already has access to traditional media outlets to begin with. Second, the ensuing power vacuum left by the two will occupied evenly by the same “attacking players”, or even none of them. This is also a very interesting scenario because this will dilute Facebook’s ability to shape the 2019 elections itself. With no major player that can rival traditional media companies, then the Philippines is back to a pre-2016 elections scenario where campaigns are dictated by who the major networks, major broadsheets, and major radio stations choose support. ThinkingPinoy still has his well-founded doubts on whether these attacks will be effective, as the attackers generally do not exercise the same kind of rigor in the materials they publish, aside from the fact that many of these attackers possess very recently uncovered political baggage that may not fade from public consciousness anytime soon. Nevertheless, ThinkingPinoy admits uncertainty as to whether he or Sasot will survive this nonstop onslaught. Regardless, the political observer in him is delighted to witness these events first-hand. ThinkingPinoy will continue to write articles of national significance as long as he can. However, should this brouhaha eventually spell the end of ThinkingPinoy’s relatively short-lived political blogging career, he sincerely wishes to thank all his followers for being with him in this very enjoyable ride. Maybe it's time to "retire"? Whichever way the wind will blow, having the rare opportunity to reach out to millions over a span of two years isn't bad at all. FACT CHECK: How exactly did Mar Roxas become "Mar Roxas Ekonomista"?